Diane Henkels has presented on diverse topics, usually related to law and environment, energy, sustainability, and social justice issues related to Indian law or the African region, in a wide variety of settings including universities and law schools, continuing legal education programs to her colleagues, lawyers, judges, and legal professionals, and informational programs to businesses and members of the public. November 2017, panelist on the topic of resiliency in a University of Portland engineering class, EGR_CE_491A_591A, Resiliency Planning for the Pacific Northwest. Performed Laf-Off standup comedy routine as a benefit for the Oregon Campaign for Equal Justice, October 2017. 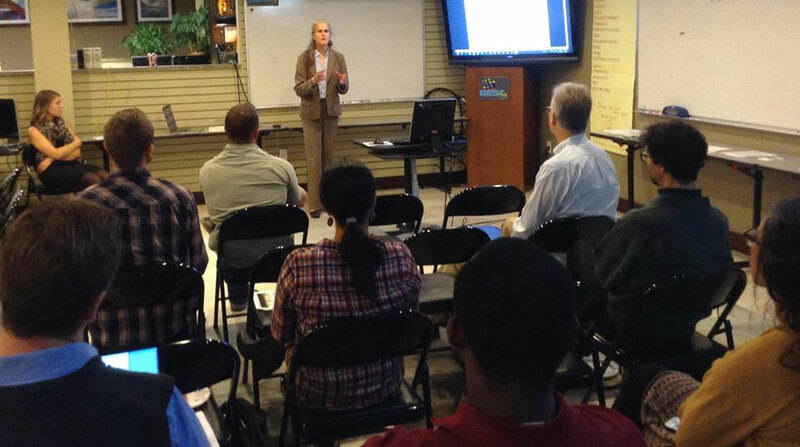 At PDX Westside Green Drinks, July 2017, Diane presented on the State of Solar in Oregon and lead great discussion with several participants on small business and solar in Oregon, the Oregon Public Utility Commission’s new Community Solar rules, reports on solar jobs and the economy, Small Business Utility Advocates, and Oregon State Legislature update. Class presenter for Prof. Cheryl Fairbanks' Indian Child Welfare Seminar, Lewis & Clark Law School June 2017. Co-chair: National Conference of Lawyers Addressing the Climate Change Emergency (2017) Lawyers from around the United States, finding that inertia at the national level does not stall legal activity made in many sectors to prevent further GHG emissions and mitigate the impact of climate change. A conference was the platform to recount efforts made in many legal sectors. Henkels represented the Oregon State Bar Sustainable Future Section presenting the SFS Climate Change Task Force Report recommendations to 200 lawyer attendees via videoconference and in person at American University Law School in Washington DC. See forthcoming conference report. 2016-2017: Chair BESThq Voices, the advocacy arm of the BESThq Benefit Company, advocating small business interests in the Oregon Legislature, energy regulatory entities among other government bodies. Recipient, BESThq Partner Award 2017. A continuing legal education program co-sponsored by Henkels Law LLC and National Lawyers Guild regarding current events and legal issues regarding people and natural resources in these central African countries. Speakers from Water For Good, and emigrants from DRC. October 2016. Chaired "Coastal Law in Oregon CLE," Hatfield Marine Science Center, Newport, Oregon (July 2008). Presenter: “Wave Energy,” Oregon Tribal Environmental Forum, Lincoln City, Oregon (2007). Panelist: "Working with Tribes to Protect Their Natural Resources", Public Interest Environmental Law Conference, University of Oregon School of Law, (March 2006). Panelist: "Environmental Law in Madagascar", Public Interest Environmental Law Conference, University of Oregon School of Law, (March 2005). Water rights and the Lincoln City Municipal Water Rights Extension Request", with Wayne Hoffman, MidCoast Watersheds Council Coordinator, MidCoast Watersheds Council meeting, (2005). "Introduction to Estate Planning" Confederated Tribes of Siletz Indians, Lincoln City, OR (2004). "Regional water supply planning" Siletz Watershed Group, Siletz, OR (2004). International trade presentation, part 1, Port of Newport, Newport, OR (2004). "Indian Civil Rights Act and the (Siletz and U.S.) Constitutions" Siletz Tribal Court Spokespersons Training (October 2003). "Juvenile Law" Siletz Tribal Court Spokespersons Training (October 2003). "Water Law: The Clean Water Act and Oregon Water Law," Midcoast Watersheds Council (2002). "The development of environmental law in Madagascar and the US," Western Oregon University Pre-law Club (2000). "Indian Law," Western Oregon University Pre-law Club (1999). "Good Neighbor Agreements: a Tool for Sustainable Development," Suffolk University Law School (1997).